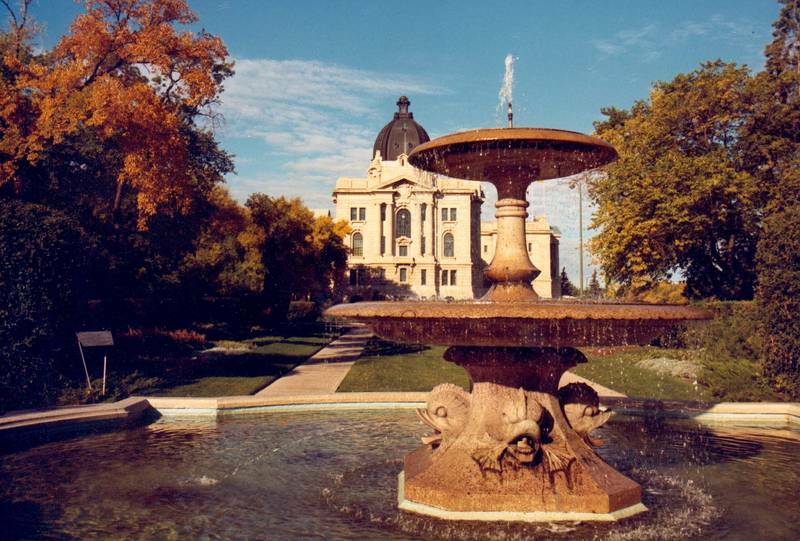 The Trafalgar Fountain located in Wascana Centre was originally one of a pair designed by Sir Charles Barry, R.A., architect of the British Houses of Parliament. These fountains played in Trafalgar Square, in London, England from 1845 to 1939, when they were removed to make way for larger fountains. 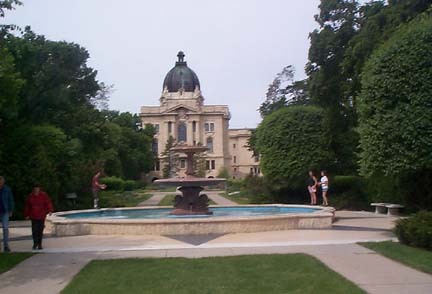 These fountains were brought to the attention of the the National Art Collection Fund of Britain who acquired them for presentation to a Dominion Capital. 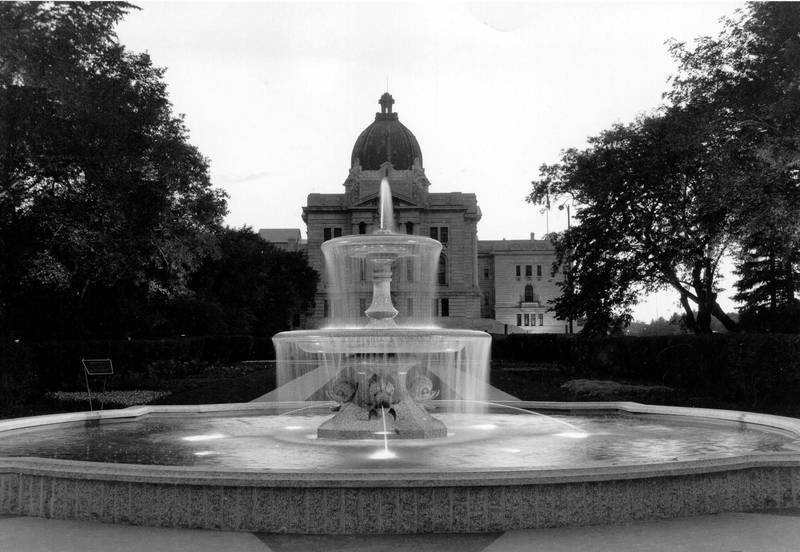 Canada accepted the gift and one of the fountains serves as a memorial to Lieutenant Colonel John By, founder of Bytown which was later renamed Ottawa. 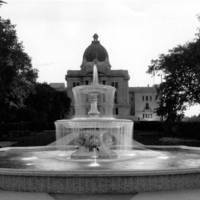 The mate to the Ottawa Fountain is located in Wascana Centre on the east side of the Legislative Building in Regina. 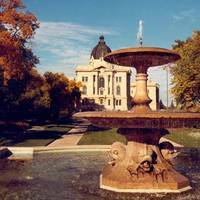 "This fountain honours the establishment of the headquarters of the North-West Mounted Police at Regina in 1882, and the officers and members who contributed to the orderly settlement of the western plains. Dedicated in the presence of The Right Hon. Viscount Amory of Tiverton, G.C.M.G. 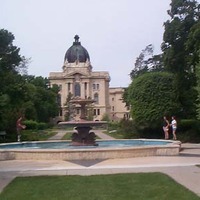 British High Commissioner to Canada on August 2, 1963 Presented by the National Gallery of Canada Erected by the Wascana Centre Authority"
The fountain is made of red granite from Aberdeen, Scotland and is 10 feet high, with two bowls, the lower bowl being 10 feet in diameter, the upper bowl being 5 feet in diameter. It is set inside of a concrete pool with a diameter of 34 feet. The pool coping and outside wall are made from Tyndale stone.